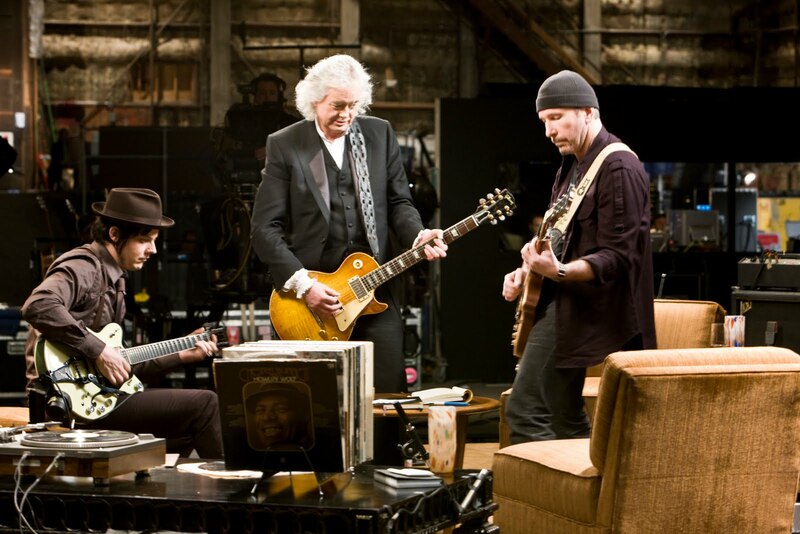 U2's The Edge is a tech gadget whiz. Jack White is a blues madman. And Jimmy Page is a master of great pop-rock hooks. The three play a few songs together and chat about their journeys on the guitar in the 2008 film It Might Get Loud. I expected this to be more of an extended jam, but much of the film is simply a documentary about the three individual legend's lives. This works well because all three are fascinating people, especially Page and White. There is great footage of Headley Grange, an English country mansion where much of Led Zeppelin's best music was composed and recorded. White talks about growing up in a poor and predominantly black Detroit neighborhood where it was "uncool" to play an instrument and where people were into hip-hop and not rock and blues. The Edge discusses his youthful inspirations from the late-70s punk explosion, which allows for some good footage from the likes of The Jam, Buzzcocks, and The Clash. Setting the anticipation of the movie-ending guitar summit and telling great stories along the way is a great recipe for a rock documentary, rather than simple concert footage. And if you're still unconvinced you should spend 100 minutes with this film, at least watch the three jam at the end on Zeppelin's "In My Time of Dying."